You are viewing the archived laundry powder ratings. Follow the link to view the current laundry powder ratings. On the hunt for a new laundry detergent? 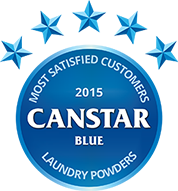 Find out what New Zealand consumers think of their laundry powder in these results. The results are in, and having crunched the numbers, we’ve found the product that Kiwis love the most: Shotz has secured our Most Satisfied Customers Award – Laundry Detergents in 2015, emerging from a close field in which all other rated brands (bar one) scored an impressive four stars overall. Close to a quarter of the respondents to our most recent survey admit that doing the laundry is their least favourite household chore, but it doesn’t have to be truly onerous! Laundry detergent is a vital component in making countless Kiwi garments shine. Without good clothes washing products, your entire wardrobe gets thrown into disarray. So, how do you know you’re getting the best products available? We’ve commissioned research into just how satisfied New Zealanders are with their laundry products, based on metrics such as value for money, cleaning power and smell. The runners-up were Drive, Surf, Coldpower, Earthwise, Persil, Fab, Ecostore, and Reflect. Have a read of the brands breakdown below. The bottom line is one of the first things you look for when buying a disposable product such as detergent is a reasonable price. Shotz came out on top when it came to bang for buck, achieving a five star rating for value for money satisfaction. Next up were Surf, Coldpower, Fab and Reflect; all with four star ratings in this area. These brands were followed by Drive, Earthwise, Persil and Ecostore – all with three stars apiece. The single biggest contributor to overall customer satisfaction (in these results) was how well each detergent actually did its job – not really surprising! Given that a quarter of our survey respondents often Google how to best remove stains, effectiveness is clearly a big selling point to customers. The winner of this hotly contested metric was Drive, with a five star rating for the quality of the clean provided by its products, and was closely followed by Shotz, Surf, Coldpower, Persil, and Ecostore, all of whom achieved four star ratings. Behind these brands came Earthwise, Reflect and Fab with three star ratings. The number of washes you get out of your laundry detergent can vary greatly, meaning this rating has a significant impact on value for money as well. There was some serious consistency in the longevity stakes; Shotz secured the top satisfaction rating. Reflect achieved a three star rating and all but one brand secured an impressive four stars for the number of washes they provided. Don’t you just love the scent of freshly washed clothes? It’s a combination of a pleasant smell and the knowledge that your favourite get-up is as clean as can be, which explains why it features highly on our survey respondents’ satisfaction ratings. Surf was the brand which produced the best-smelling clothes, according to our research, securing our maximum five star rating. All other brands scored four stars for their scent, with the exception of Reflect which scored three – a very consistent result. How do clothes feel after being subjected to the cleaning chemicals your detergent? Early cleaning products were often quite harsh on clothes over extended periods of time (and many stain removers still are), but the laundry detergents we surveyed are anything but; four brands secured the maximum five stars in this area – Shotz, Drive, Persil and Ecostore. These were followed by four star achievers Surf, Coldpower, Earthwise and Fab; with Reflect rounding out the field on three stars. Canstar Blue commissions Colmar Brunton to regularly survey 2,500 New Zealand consumers across a range of categories to measure and track customer satisfaction. The outcomes reported are the results from customers within the survey group who have purchased and used laundry detergent in the last three months – in this case, 1,725 laundry powder shoppers.